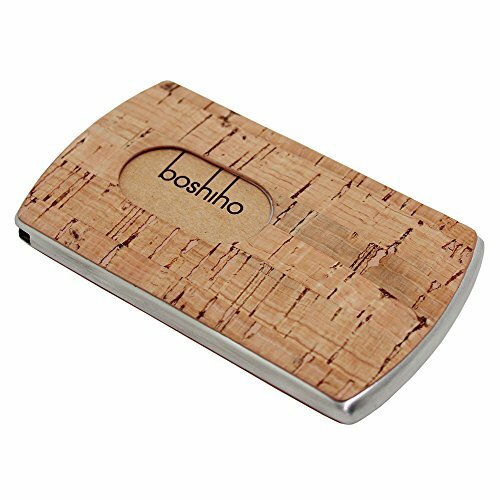 - Boshiho Cork and Stainless Steel Business Name Credit IDCard Holder features stainless steel construction with cork surface. It is a cool card holder to carry around and receive great positive comments. - Elegant design Business Card Case is a slim and compact storage solution. - Slim design and easy to use! With the flexible spring attached flush inside this holder, cards slide out easilyand you don't have to worry about opening a case. - A Great Gift Idea for both men and women. - How to use: Press down the spring and slide the cards out! 4 - Are Boshiho products GREEN? Yes, it certainly is one-of-a-kind gift. Due to nature of cork, every single product is different and unique, grain and color may slightly differ from one to another. Dimension: 10.1 * 5.9 * 0.8 cm / 4" x 2-1/3" x 1/3"